This baby shower cake is just bubbling with fun and creativity! 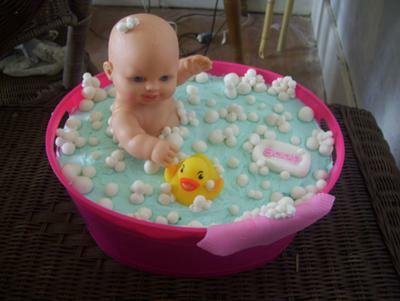 Amy put all kinds of attention to detail when she made this baby bathtub cake. I love all the cute bubbles and soap she made with fondant! So fun! Thank you so much for sharing your cake idea with us Amy! I made this adorable bath time bubbles baby cake. I purchased a plastic party tub, a plastic baby doll and a rubber duck. First I baked a sheet pan size cake. I made a template of the tub top and bottom. Then I cut the shapes. Using a cake board flipped them over, I added the bottom layer, a layer of icing then added the next layer. I cut a small hole to fit the doll in a sitting position .Placed doll in the hole and spread a light blue icing over the top of the cake. Then using fondant made a washcloth, a bar of soap and lots of different size balls for bubbles. Then I put the bubbles in a baggie along with edible glitter and shook them, giving them the appearance of soap bubbles. I added the duck and all the decoration and sprinkled more edible glitter over all of the cake. I also made cupcakes. I added the bubbles on them and placed them around the base. Its in two layers just like a tired cake and there was a separator .Just lifted it out. I love this...it is VERY cute! I only have one conern. How did you serve it without it looking like a blob of crumbs on a plate. I can't figure out how to get it out of the bowl and not make a huge mess! That is the most creative and beautiful cake I have ever seen. WOW I wish I could do that. Congratulations!! !